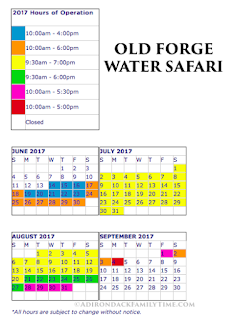 Adirondacks: Old Forge Water Safari 2017 Discounts and Ways to Save! 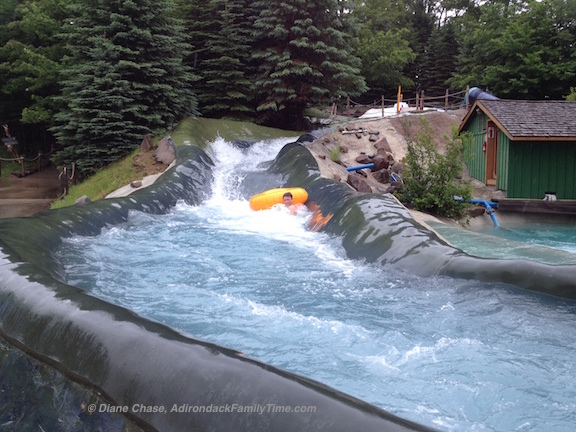 My ADK kids have braved the twists and turns at Central Adirondack's Old Forge's Enchanted Forest/ Water Safari's water park on numerous occasions. 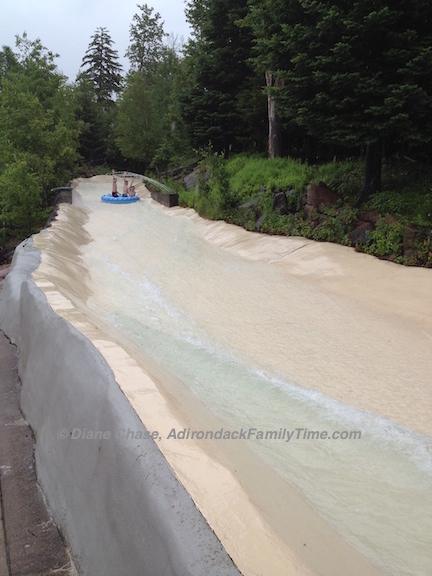 With over 50 rides to choose from, 32 of them water rides, Enchanted Forest Water Safari is New York's largest water-theme park. 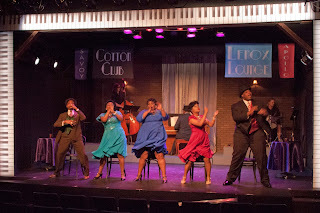 Wed, June 14 - Mon, September 4! During the heat of the summer going to a favorite swimming hole is always on our radar, but finding a clean, well organized, inexpensive amusement park/water park can be a bit more challenging. What is included with Admission: Enchanted Forest/Water Safari has three sections of the park, water-themed rides (tiny tots and older kids/adults), amusement park rides and enchanted character buildings/visits. 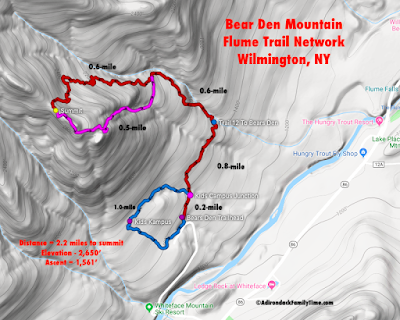 Here is a map. The Enchanted Forest section includes Museum of Enchanted Memories, Paul Bunyan, Rocky and the Ramblin' Rascals Storybook Lane, Timber Bear's Barnyard, (petting zoo) Dawson City, Family Circus Show, Walter Safari. In the Amusement Rides look forward to bumper cars, a ferris wheel, Round-Up, Rock-O-Planes, Scrambler, Sky Ride, Tilt-O-Whirl, Enchanted Forest Express (train) as well as A Tiny Tykes section for little kids: Pygmy Pond, Sawmill, Walter's Wild Slide, Helicopters, Flivver Cars, Carousel and Boats. The Water Rides include Amazon, Black River, Bombay Blasters, Cascade Falls, Killermanjaro, Laek Nakura, Log Jammer, Nairobi Narrows, Raging Rapids Ronda Run, Safari River Expeditions, Serengeti Surf Hill, Shadow, The Curse of the Silverback, and Tidal Wave Pool. According to Jeffrey LeBuis at Water Safari, here are some of the other places for area discounts. Some Credit Unions sell discount tickets to their members. Your ticket is good for the whole day so if you want to leave and check out other Old Forge attractions, make sure to get your hand stamped at the Paul Bunyan Gift Store. 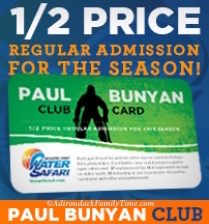 If you enter the park after 3 pm, you are automatically issued a second pass for a FREE day at Water Safari. (A Siesta pass is good until the end of the season. 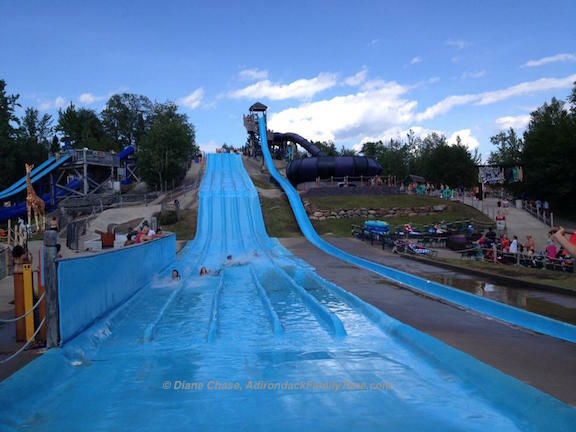 Some water parks issue passes that are only good for the next day. 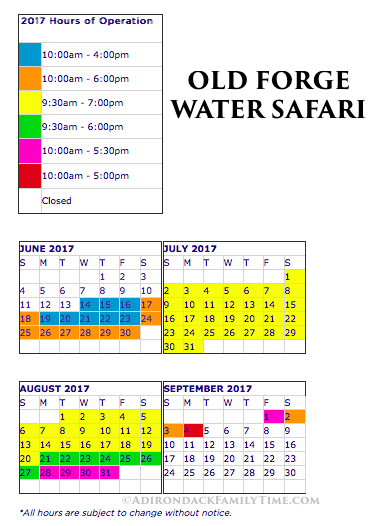 Old Forge's Water Safari is good into September! Parking: FREE. It can't be any clearer. There was plenty of parking and there wasn't any additional "hidden" costs. Some water parks won't let outside food on the premises. Water Safari has picnic areas available as well as numerous food stations. We brought in coolers and plenty of water so our kids had plenty to eat. It helped costs to a minimum. The cost of renting a locker is reasonable ($5) with a $5 deposit for the key. 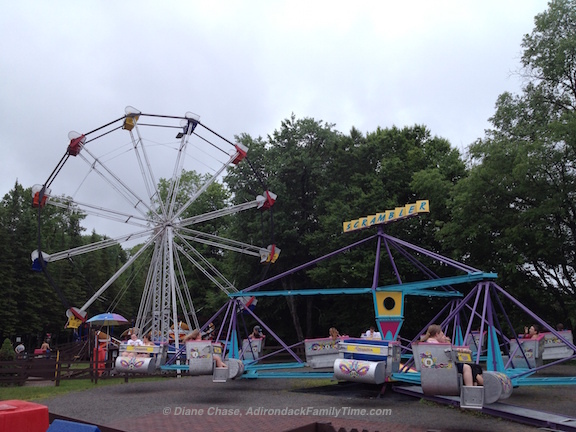 It allowed everyone to enjoy the rides without having to worry about belongings. 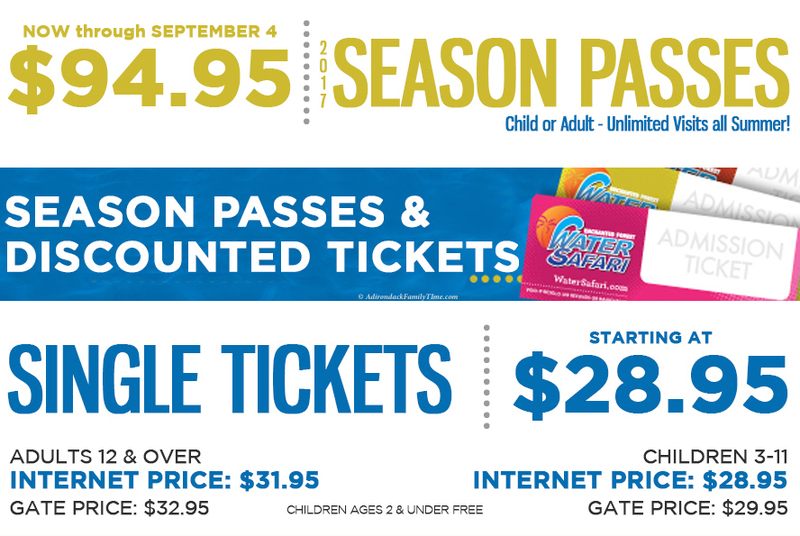 If you plan on spending any money at Water Safari, I recommend getting Splash Cash. 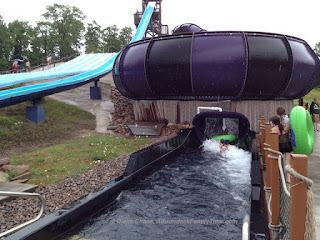 There is no fee to get the Splash Cash wristband or card. Just load the amount of money you think you'll spend and at the end of your stay get all your money back by visiting Guest Services. Splash cash can also be used at Calypso's Cove, Old Forge Camping Resort and Water's Edge Inn in addition to Enchanted Forest Water Safari. Then you don't have to worry about carrying your wallet. No Hidden Costs! Lines can be long, especially on a hot day. 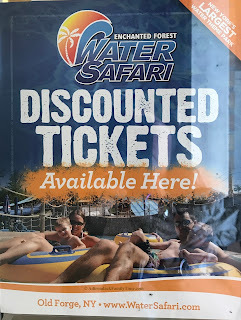 Water Safari was busy and we did have to wait, but the kids just alternated between the high volume rides like Serengeti Surf Hill and Killermanjaro with a long soak in the Tide Pool or Lazy River. The bathrooms and changing rooms were immaculate. I still recommend wearing flip-flops as much as possible, but it wasn't necessary. I thanked our attendant Bonnie for her fabulous job. She told me that she probably had over 6,000 people come and go throughout the day! Clean! I saw some garage on the ground, but attendants were very quick to pick it up. Trash cans were not overflowing. I also saw attendants sweeping around the picnic area. Adirondack Family Time Tip: When you are ready to leave, stop by the Adirondack Dog house for a Texas Style Hot Dog. Daily specials are posted here!